Adding to the difficulty of eulogizing him, because of David Bowie’s incredibly long career and chameleonic shifts, he probably means something different to everyone. 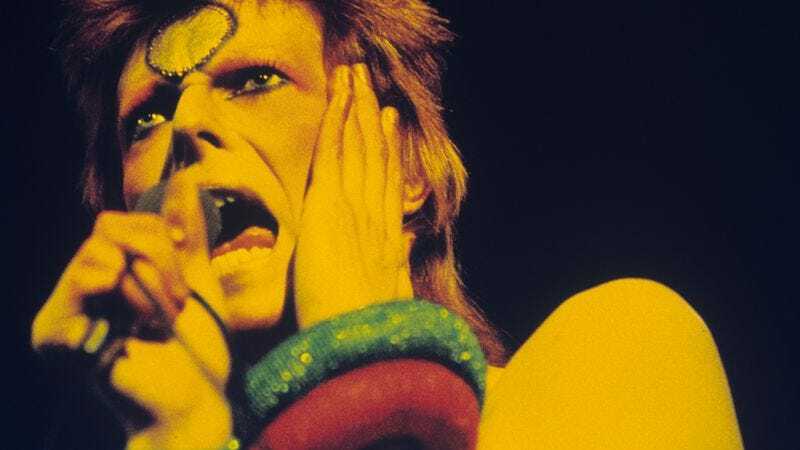 To the repressed British kids who witnessed him singing “Starman” on Top Of The Pops in 1972—an androgynous, oddly sexual extraterrestrial that even the acid-fried, free-love hippies couldn’t wrap their heads around—he was something akin to a savior. The final stanza of “Rock ‘N’ Roll Suicide,” which closed both the Ziggy Stardust album and its accompanying live shows, finds Bowie’s alien rock star wailing, “You’re not alone” to an audience of fellow outsiders, taking their hands and absorbing their pain like a misfit messiah. And that message has reverberated through each successive generation; everyone who’s ever felt weird or confused (been a teenager, in other words) can find a friend in David Bowie. At the same time, Bowie was also the epitome of cool, always living at the bleeding edge of glam rock, punk, new wave, and alt-rock, and inspiring a million acolytes across every spectrum of the music and fashion those genres spawned. Bowie was the locus of so many musical movements, you could arguably separate our culture into a pre- and post-Bowie world. His enthusiastic support for and collaboration with his personal heroes like Lou Reed and Iggy Pop placed him atop of an evolutionary ladder of “underground” rock that’s still mutating today. On the other hand, his early, visionary embrace of the possibilities of music video set a template for every MTV wannabe to follow—and made him one of the nascent network’s early kings—while his many stylistic overhauls taught performers like Madonna and Kanye West how to stay relevant. Bowie was at once king of the freaks and the biggest pop star who fell to Earth, and while he may have occasionally struggled with reconciling the two, the world—remarkably—did not. And let’s be honest: To some people, David Bowie is a brand, a guy whose lightning bolt-adorned face has been so seared into the public consciousness for so long, his influence so deeply subsumed into 50 years of music, that it’s impossible for them to grasp what made him so special. Or maybe he’s just “that guy from Labyrinth” (or “that guy who cameoed in Zoolander”). Maybe he’s the trope the self-destructive Ziggy Stardust feared becoming, and that Bowie fretted over and fought against his whole life: the elder statesman, his once-unusual tastes and social transgressions now as quaint as the banal rock stars he once cut such a bizarre figure against. That Bowie could contain so many multitudes, ironically, only speaks to his individuality. Bowie may have tried on artistic directions and personas like stage outfits, but beneath them all he remained unmistakably, inimitably Bowie, even before he himself knew exactly who that was. Even though his earliest Decca recordings—a jumble of psychedelic pop, vaudevillian whimsy, and stoned children’s ballads like “The Laughing Gnome”—may seem lightweight compared to his later work (and both he and his fans would more or less ignore it), Bowie’s ambitious attempts to fuse rock and cabaret theatricality were already present, inchoate as they were. By his second self-titled album—more popularly known as Space Oddity, after its iconic hit single—those avant-garde tendencies were vying uncomfortably with his divergence into acoustic folk to mostly unremarkable result, even though it was still impossible to imagine Bowie sharing a stage with the likes of Joan Baez. Then came The Man Who Sold The World, with its hard-rock guitars and arrangements from Mick Ronson and producer Tony Visconti finally giving Bowie’s needling voice and existential angst the musical edge it demanded. From then on, every generation would get the Bowie it deserved. From there, Bowie would only grow bolder and more powerful, practically birthing glam rock and giving it glittering gods to worship in Ziggy Stardust and Aladdin Sane, then snatching them away just as suddenly—reemerging as first the nihilistic punk prophet of Diamond Dogs, then the Philadelphia-worshipping, “plastic soul”-purveyor of Young Americans. His creation of the Thin White Duke in the 1970s—a hollowed-out shadow of a man singing torch songs that were cocaine-numbed of all emotion—reflected Bowie’s own mental retreat from the fans that loved and made so many demands of him, just as the world itself was overcome with apocalyptic paranoia. Bowie’s actual, physical retreat to Berlin with Brian Eno produced a triptych of boundary-pushing, Krautrock-derived albums—Low, Heroes, and Lodger—that remain the subject of endless, nigh-mythological study and reverent worship. And his subsequent return as a new wave demigod—first on Scary Monsters And Super Creeps, then with the smash Let’s Dance—saw him take his rightful place atop the empire he had spawned, with the erstwhile King of the Freaks now singing songs for stockbrokers to dance to. Bowie’s embrace of mass popularity reflected the era of ’80s excess—and when it finally threatened to consume him, to reduce him to the self-parody of his bloated Glass Spider tour, Bowie once again took a match to it all, rising from the ashes in the ’90s with the leaner, angrier rock of Tin Machine and the industrial and electronica-tinged cuts of Black Tie White Noise, Outside, and Earthling. At the same time, artists like Trent Reznor and Kurt Cobain (whose Unplugged cover of “Man Who Sold The World” gave the song its greatest American exposure) reintroduced David Bowie to kids who’d only ever known him as a classic rock/movie star, and had likely never fully grasped the depths of his uniqueness or its impact on the ”indie” culture they took for granted. Different and occasionally trend-chasing as they were, through each of these incarnations, Bowie offered repeated testimony to the transformative power of art—and the task incumbent upon art to spark that transformation. That art should be a means of liberating and losing yourself completely, of taking the messiness of the human condition and repurposing its tattered rags into a fabulous new outfit. That sexuality and enthusiasms and identity can be fluid and temporary—that, in fact, they should be. That, like life itself, art should always be weird and unpredictable. Otherwise what’s the point? It’s easy to forget now—after Bowie spent so many years in stately repose, the artifacts of his life pored over until they became a literal museum exhibit, his template filtered and Xeroxed through decades of disciples—that these ideas weren’t always mainstream, or that there was ever such a thing as a “pre-Bowie” world. But the same way that David Bowie was changed by collecting and absorbing his various identities, culture was changed by collecting and absorbing his, coming to embrace being different as not only something acceptable, but the mark of being truly alive. The fact that we regard someone as proudly, deliberately freaky as David Bowie as some sort of institution is only further testimony to that. And once the pain of the loss has faded and long after he’s gone, we’ll still be drawing inspiration from his example. In that way, death is just the latest of David Bowie’s many guises.